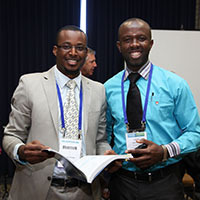 Whether formal or informal, the connections you will make at ATS 2015 can be long-lasting and have the potential to lead to research collaborations, jobs, grants, and journal articles. During the conference, attendees will have many opportunities to connect at the following events and venues. The ATS 2015 Opening Ceremony from 4:30 to 5:30 p.m. on Saturday, May 16, is certain to entertain with keynote speaker Aasif Mandvi, an actor, comedian, and Daily Show Senior Correspondent; a celebration of the ATS Foundation’s 10th anniversary; and recognition of the Society’s international reach through the ATS Methods in Epidemiologic, Clinical, and Operations Research (MECOR) Program and its advocacy efforts via the ATS Washington, DC, office. Immediately following the program will be a reception where attendees can meet old and new friends and colleagues and enjoy light refreshments. The Networking Exchange for Early Career Professionals (formerly the Career Development Exchange) will also take place 5:30 to 6:30 p.m. Saturday. This annual event is geared toward medical students, residents, fellows, junior professionals, and post docs transitioning from training in their careers. In this relaxed atmosphere, attendees can network with peers, ATS leaders, and representatives from health care and research funding government agencies. Beverages and appetizers will be provided. Please note that the free event requires registration. Capping off the night will be the Seventh Annual ATS Foundation Research Program Benefit, an evening devoted to supporting research and honoring Marvin Schwarz, MD, a legend in pulmonary medicine, particularly in the field of pulmonary fibrosis. Dr. Schwarz will be presented with the 2015 Breathing for Life Award, the highest honor given by the ATS Foundation in recognition of philanthropy. The benefit begins at 7 p.m. at the Hyatt Regency Denver at Colorado Convention Center. All are invited to attend the 14 ATS Assemblies’ annual Membership Meetings during the ATS International Conference. The Assembly on Behavioral Science and Health Services Research and the Assembly on Pediatrics will meet from 6:30 to 8:30 p.m. on Sunday, May 17. The other 12 assemblies will meet from 5 to 7 p.m. on Monday, May 18. The meetings will be held in various locations. During these meetings, attendees receive an update on the Assembies’ activities and have a chance to share their input with leadership. Voting results for the Assemblies’ future leaders also will be announced. All Assembly members and other interested individuals are invited to attend. After the Assembly Membership Meetings, the following Assemblies will hold dinners or receptions in various locations from 7 to 10 p.m. on Monday, May 18. Pre-registration and an additional fee are required if you are attending the dinner/reception. Tickets will be required at the door and entrance without ticket will not be permitted. Seating is limited. Please register online. Conference attendees who have contributed $300 or more between June 2014 and May 2015, are invited to relax, enjoy complimentary breakfast, coffee and snacks, check emails, print documents, and use the Internet free of charge in the ATS Foundation Donor Appreciation Suite at the Colorado Convention Center, which will be open Saturday, May 16, to Wednesday, May 20. Donors can also skip the lines at registration and make their arrangements in the suite. Gifts are welcome on site by check or credit card. Diversity within the fields of pulmonary, critical care, and sleep medicine will come into focus at the annual Diversity Forum 11:45 a.m.-1:15 p.m. Sunday, May 17. The forum, which allows attendees to interact over lunch, will feature guest speaker Richard H. Carmona, MD, MPH, who will address issues related to diversity followed by a question and answer session. Minority Trainee Diversity Scholarships (MTDS) will also be presented during the forum. MTDS recipients are selected for the quality of the science in their submitted abstracts. Then from 11:45 a.m. to 1:15 p.m. Monday, May 18, the annual Women’s Forum will likewise allow attendees to interact while recognizing achievements and supporting the activities of women in the field. Guest speaker Judith Albino, PhD, associate dean for strategic planning and development at the University of Colorado, Denver, will cover topics relevant to female medical professionals. Dr. Albino also is principal investigator and director of the Center for Native Oral Health Research, the only NIH-funded center for research in oral health disparities focused on the American Indian/Alaska Native population. The 2015 Elizabeth A. Rich, MD, Award will be presented to ATS member Cynthia S. Rand, PhD, a renowned researcher at Johns Hopkins University School of Medicine. Men are invited to attend. Lunch will be served during both forums, which are sponsored by the ATS Membership Committee and hosted by Yolanda Mageto, MD, MPH. Registration is required to obtain an audience count, but tickets will not be issued. Only conference badges are required for admission, and seating is first-come, first-served. The Center for Career Development is a networking and career development forum for physicians and other health care and research professionals who are in training or have transitioned in their careers. The CCD hosts a variety of workshops specifically geared to address such topics as how to get a job, mentoring, and negotiating a contract. At the center, the Members in Transition and Training Committee will present the ATS 101 Orientation Session, from 12 to 1 p.m. Sunday, May 17. The session will provide an overview of how the ATS works, how to get involved, and how to navigate the conference, and appetizers and beverages. The center will also host themed social hours 3:30-4:30 each day with researchers on Sunday, clinician educators on Monday, and early career professionals on Tuesday. Appetizers and beverages will be served. Clinicians can meet, relax, learn, and gather information and resources in the Clinicians Center, which will be open Sunday, May 17, to Tuesday, May 19. In addition to the learning opportunities (see Advance Your Clinical Knowledge and Expertise), the center will offer a light complimentary breakfast from 7:30 to 8:30 a.m. each day. Also scheduled are a meet and greet reception for nurses from 11:30 a.m. to 12:30 p.m. on Sunday, May 17, and an award reception for Outstanding Clinician Award recipient James P. Lamberti, MD, from 4 to 5 p.m. on Monday, May 18. Attendees participating in the adult and pediatric core curriculum sessions are invited to take their respective MOC exams in the Clinicians Center, where dedicated computers will be available Sunday through Tuesday. The Science and Innovation Center will host networking and interactive sessions by experts. See the learning opportunities in “Get Inspired with ATS 2015 Basic, Translational Science Offerings.” This year, the center will also present the Scientific Abstract Awards event Monday afternoon to celebrate the best scientific abstracts submitted to ATS 2015 Denver by early career professionals. On Tuesday morning, the center will host the Early Career Professionals Coffee Corner, in which mentors and mentees are invited to gather and socialize. Later on that day, the center will feature an National Heart, Lung, and Blood Institute presentation followed by networking. The center will offer breakfast at 7 a.m. Sunday to Tuesday, and light refreshments will be served from noon to 1 p.m.
Sunday, May 17: 10:30 a.m. to 5 p.m.
Monday, May 18: 10:30 a.m. to 5 p.m.
Tuesday, May 19: 10:30 a.m. to 3 p.m.
Mid-morning coffee: Complimentary coffee will be served each morning at 11 a.m.
Unopposed hours: From 1:15 to 2:15 p.m. each day, visit the Exhibit Hall and enjoy complimentary beverages and dessert when no educational sessions events conflict with your time on the floor. Bistro ATS Lunch Option: Bistro ATS provides a comfortable setting for attendees to eat, meet, and network with colleagues and fellow attendees during lunch. Bistro ATS offers an all-inclusive buffet lunch with beverages and dessert. Lunch is available from 11 a.m. to 2:30 p.m. daily at $23 per attendee, per day, which includes express entry and a reserved seat. View the menu, which changes daily. Networking Nooks: Head to one of four Networking Nooks to connect with peers and colleagues, grab a coffee, or just take a break at 11 a.m. and 1:15 p.m. each day. Follow @atscommunity on Twitter and use the hashtag #ATS2015, and like the ATS on Facebook to stay up date on the latest news, chat with other attendees, and see photos from Denver. And be sure to post photos on Instagram and connect with the ATS on LinkedIn. The Seventh Annual ATS Foundation Research Program Benefit is generously supported by Genentech (Sapphire Level – $100,000); Genentech-Novartis (Platinum Level – $60,000); AstraZeneca LP ( Gold Level – $25,000); FREEMAN (Silver Level – $10,000); and MEDA Pharmaceuticals, Inc. (Silver Level – $10,000).